I wanted to follow-up with this post for some of you that may be considering or in the process of patching software on the ImmersionRC Vortex 250 Pro. Please, stop and read FIRST. ImmersionRC has made a very admirable attempt to make flying racing drones much easier. 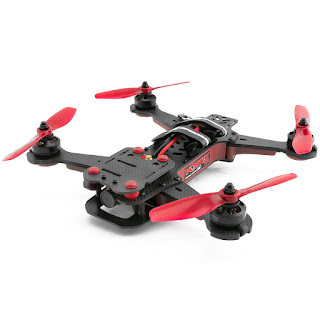 And believe me, I have built two racing drones before purchasing my Vortex and it's an amazing piece of gear. So don't wring your fists at ImmersionRC just yet. It's likely if your having problems during patching there there's probably nothing wrong with your Vortex hardware. I think where ImmersionRC falls a little short is in their documentation and even they have admitted as much. Let's get on with it. To be successful there are a few pieces of information need to learn that are not covered in the manual. It may be the type of stuff that's obvious to expert multi-rotor builders but it's worth covering for everyone. Like me, you may have built a few drones on your own. Because the Vortex has many of the components in common with DIY drones like flight control software and hardware you may be inclined to patch the Vortex like you patch your other DIY aircraft - but don't. I have spent the last 2-days frustratingly trying to patch my Vortex like other aircraft I have that use Cleanflight and Betaflight. In my case, I would patch the flight controller with Betaflight in the usual way. Next, I would fire up the Betaflight Configurator desktop tool, configure my transmitter, my PIDS, etc. Each time I changed some options on the configurator tool I would switch screens in the app to another screen and then return to the screen I made my changes. Usually this is a good test to see if the values have been saved in the flight controller. Each time you change a value, move to another screen, and return to the screen where you changed the settings it forces the configurator to load the settings from the flight controller again. If the values are the same as you changed them then they have been "burned" into the flight controller. In my case on the Vortex, I would apply some changes, check them in the way I describe. To be extra sure my values where saved I power cycled the aircraft (unplug/replug battery). When I returned to the configurator and open the last settings screen where I made changes I discovered the original values where stored not the values I set. Essentially, the aircraft would forget all my settings if powered off. I was not sure what to do. I thought the problem was bad versions of flight control software or differences in the configurator vs. flight controller version. None of this was a problem, it turns out the Vortex is trying to make setup easy for us and in the process of making things easy during setup if you attempt to configure flight control software as usual you will be frustrated. I realize I have probably covered the problem in a little too much mind numbing detail but I wanted to put some bread crumbs out on the Internet in the event others are suffering from similar problems. Keep in mind, this works well around the time of this article but ImmersionRC could improve the hardware in the future. To restore all software on my Vortex 250 Pro to a known working state I did the following. 2) Install the latest version Baseflight Configurator. I have only used Baseflight. I hear some on the forums using Cleanflight but I have not used it on the Vortex myself. 3) Install Baseflight/IRCFUSION3 flight control software on the Vortex. Don't bother configuring it yet. 5) Use your FPV goggles to configure your Vortex with your transmitter. 7) Now you can enter the Betaflight Configurator to set, flight modes, PIDS, etc. Keep in mind, not all settings can be changed since they are configured by ImmersionRC's OSD. *Version 29 is not available publicly on ImmersionRC's website - to my knowledge. I'm not sure why good Vortex 250 PIDs are so damn hard to find. Ordinarily sharing PIDs does not make too much sense for DIY racing drones. Everyone's builds are just different enough so someone else's PIDs will probably not be too helpful anyone but that's not the case with Vortex. We all have the same aircraft with some minor differences. The weights of antenna's, differences in batteries, etc. However, if your going with ImmersionRC's recommended setup of a 1300mAh battery then these PIDs will be a good starting point. Please, please, please, write down any settings before you change them so you can easily roll back. I developed these over time and it seems reasonable it will work for others. My son has the Ummgawd edition and it was a good starting point for him so it works for both 5x4x3 and 5x4x4 props. You may need to touch up the settings slightly for flying 2-bladed props so iron out the vibration but it should fly ok. I do fly with a little more expo on Taranis transmitter so if the aircraft if a bit sluggish you may want to bump up the expo to your liking. Enjoy!